Feel the journey of Ryan Harris and Lucy Watson as they struggle to pass through the eighth grade. Order Asad Akbani's debut novella, a budding writer, at the age of 14. 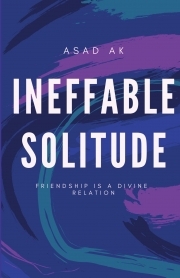 Asad Ak is a juvenile author, and 'INEFFABLE SOLITUDE' is his debut novella. He was born on 26th October, 2004, and is now of 14 years. He has been a writing enthusiast from a young age. Feel free to talk to him, as he loves to hears from his readers.